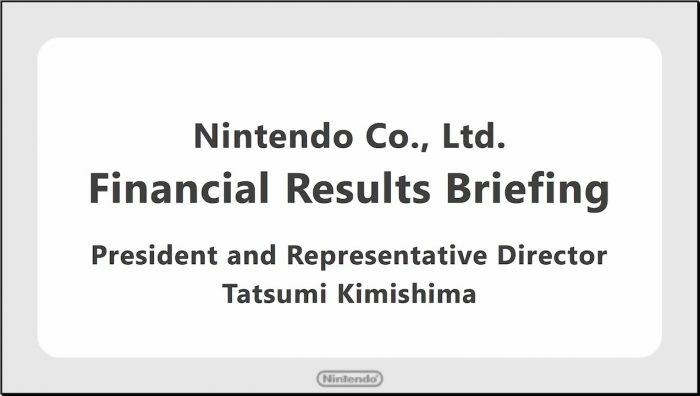 Thank you for making time to attend Nintendo’s financial briefing. I am Tatsumi Kimishima, President of Nintendo. Mr. Furukawa, General Manager of the Corporate Planning Department, has just presented our financial results for this period. I will now discuss our planned initiatives for the fiscal year ending March 2019. 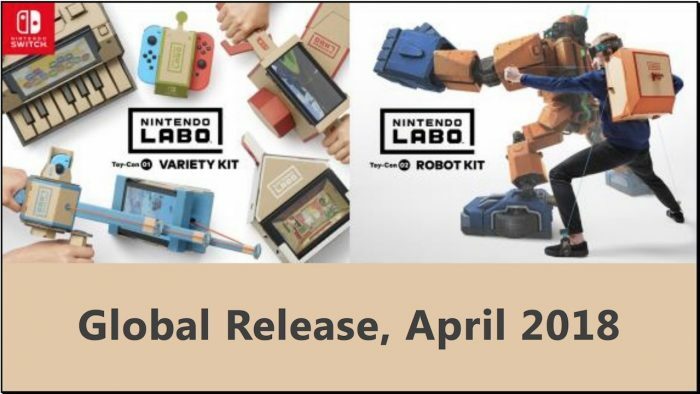 Firstly, Nintendo Labo has had the high expectation as a “very Nintendo” product since the original announcement in January this year, and as soon as it was launched, consumers have been posting photos and video of parents and children as they work together to assemble the cardboard pieces and then play with their completed Toy-Con, which were unimaginable in video games before. It has been on sale for only a week in Japan and the US, while sales in Europe will begin today, but the main purchasers of Nintendo Labo at launch are not the same as with typical video games, and they are mainly elementary school children and their fathers, as well as game players who like creative activities. 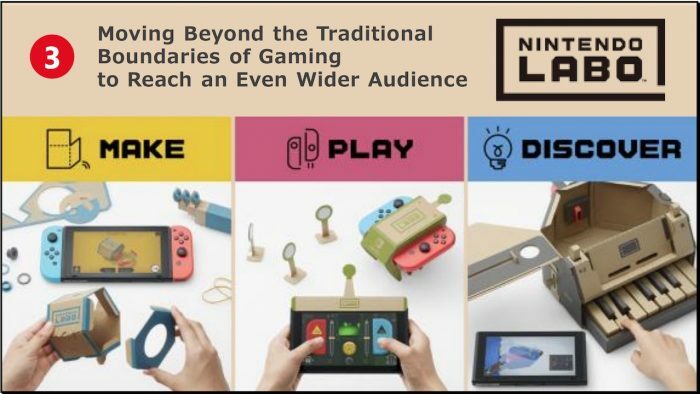 We developed and will nurture Nintendo Labo as a product that is not constrained by the boundaries of conventional video games and can endear itself to a broader range of consumers. From the initial response, we have this solid feeling that we are off to a great start in that regard. 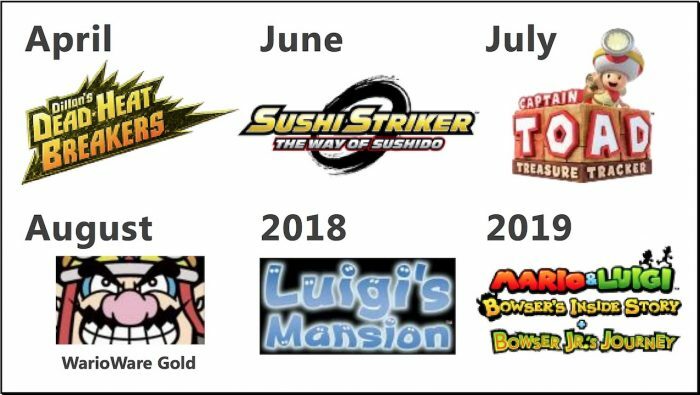 We began releasing Nintendo titles non-stop with the launch of Nintendo Switch, and kept the new-release buzz alive through the end of the year. We are continuing to release new titles since the start of this new year as well. 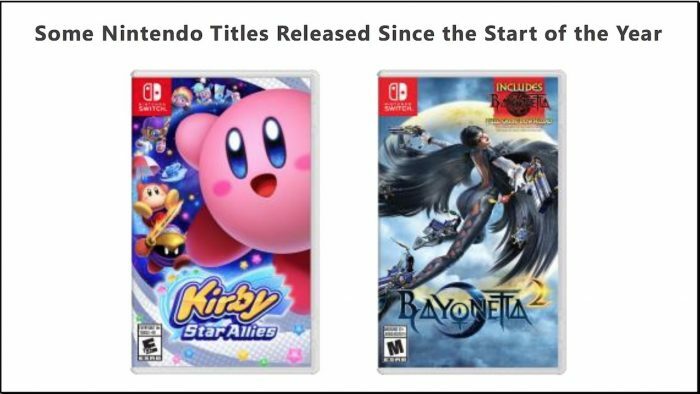 And we are selling more titles across a broad array of genres, from those with widely accessible characters and settings like the Kirby series, to those like Bayonetta that are well regarded by game fans, all of which gives us a real sense that our consumer base is growing. 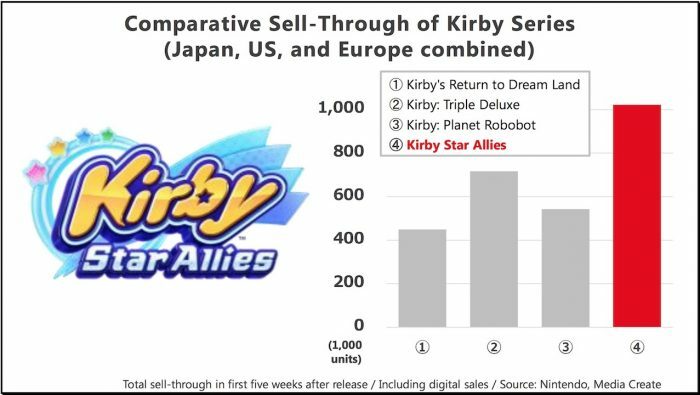 This graph shows the total sell-through of Kirby Star Allies immediately after its March release, compared to the sell-through for the same period of time for other titles in the Kirby series. This is one Nintendo Switch title that had more momentum from the start than other past titles. 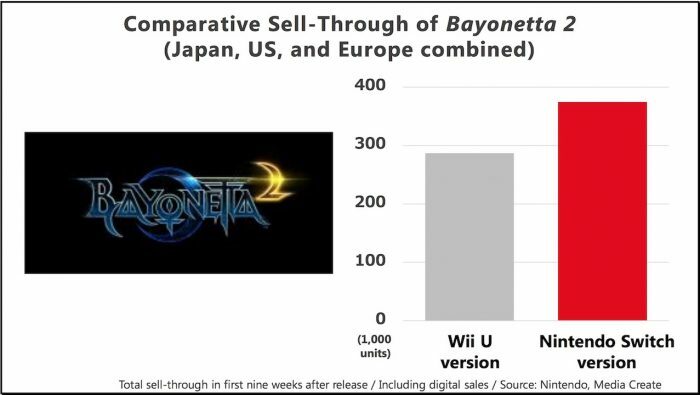 This graph shows the total sell-through of Bayonetta 2 immediately after its February release for Nintendo Switch, compared to the sell-through for the same period of time following its 2014 release for Wii U. The Nintendo Switch version of this title quickly surged past the original Wii U version. 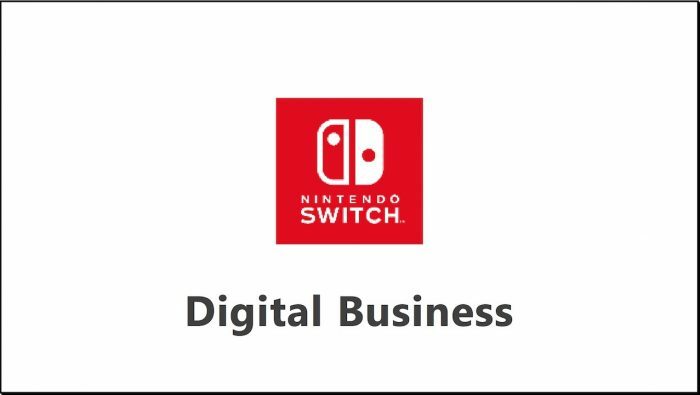 Looking back at the previous fiscal year, one important aspect to highlight about Nintendo Switch during its first year was the huge growth of its digital business compared to past Nintendo platforms. This graph compares the sales of digital content through our dedicated video game platform business over the past few years. 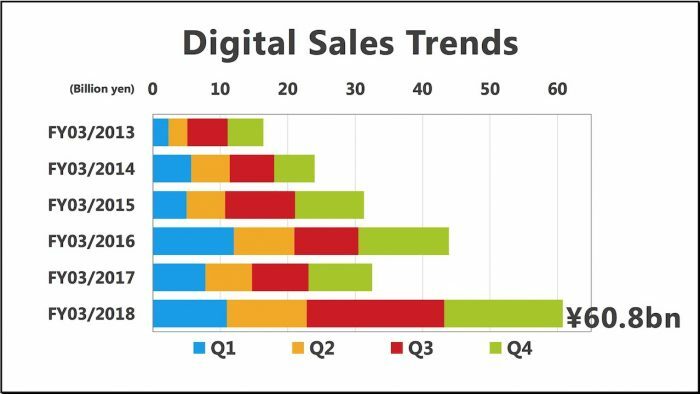 To reflect these changing circumstances, what we used to refer to as “download sales” are now called “digital sales.” Our digital sales reached a new record high in the fiscal year ended March 2018. 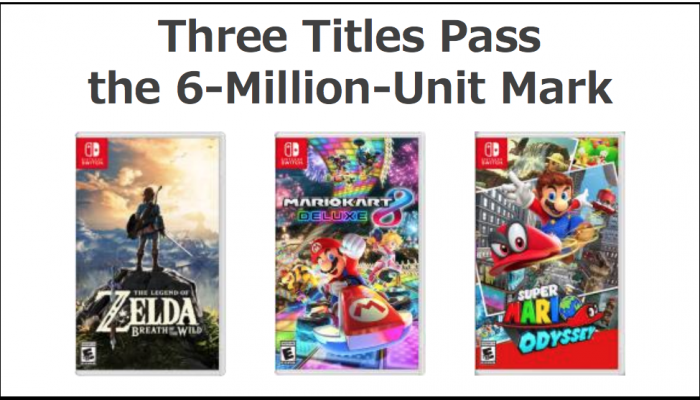 We are not disclosing the specific breakdown, but downloadable versions of packaged software and add-on content for Nintendo Switch did make a major contribution to growth in digital sales. Note: FY = Fiscal year (April through March of the following year). 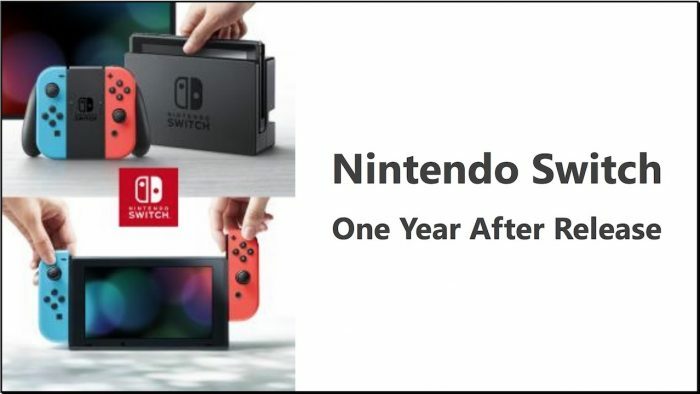 And now one year has passed since Nintendo Switch launched last March. 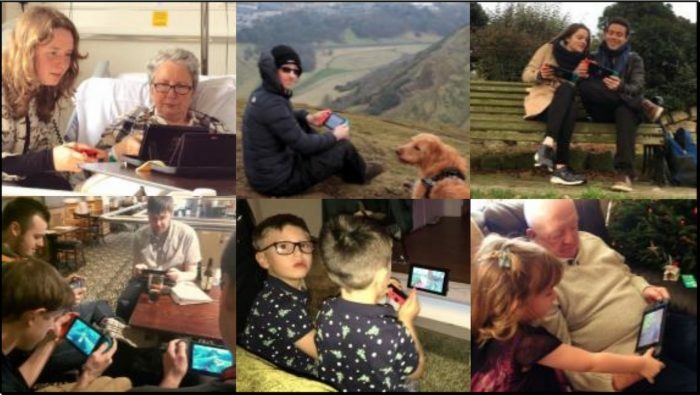 The new concept of a home gaming system that can be taken out on the go has been well-received by people worldwide from the very beginning. 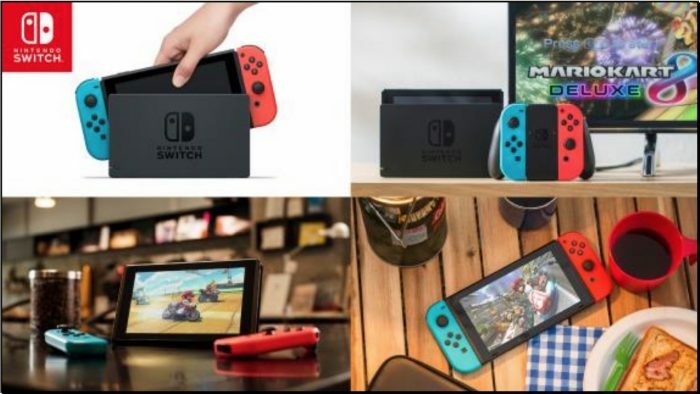 With Nintendo Switch, you can take your home gaming system out with you wherever you want to go, and the ability to share the Joy-Con controllers means you can start a game anytime, anywhere, with anyone. When people bring their Nintendo Switch with them, they can start local cooperative or competitive play anywhere they go. Consumers who purchase Nintendo Switch are taking advantage of the hardware’s unique features to match their personal styles of play and to enjoy playing games in places and in ways that were unimaginable before. 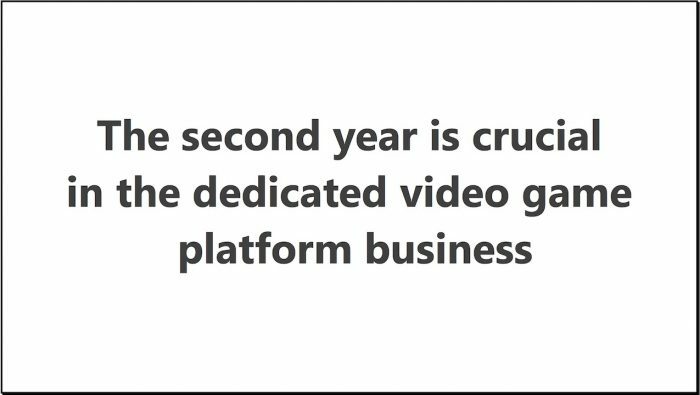 In the dedicated video game platform business, the second year is all-important. The second year is when the novelty has worn off and the hardware is truly put to the test. During this fiscal year, we will take advantage of the stage we set in the first year to further expand the installed base. To expand the installed base of Nintendo Switch, there are a number of points to consider. 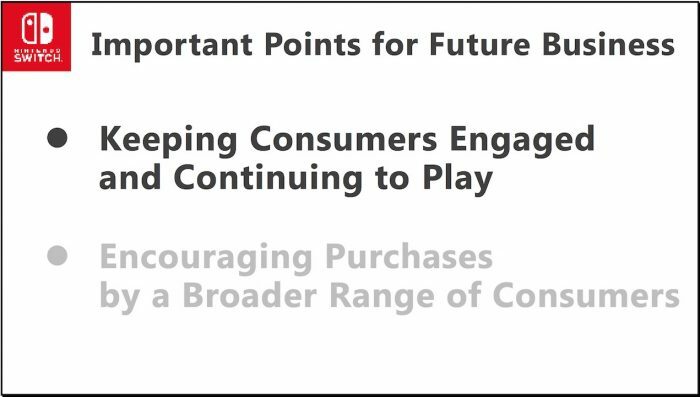 The first is our goal of keeping consumers who have purchased or plan to purchase Nintendo Switch engaged and playing with Nintendo Switch. 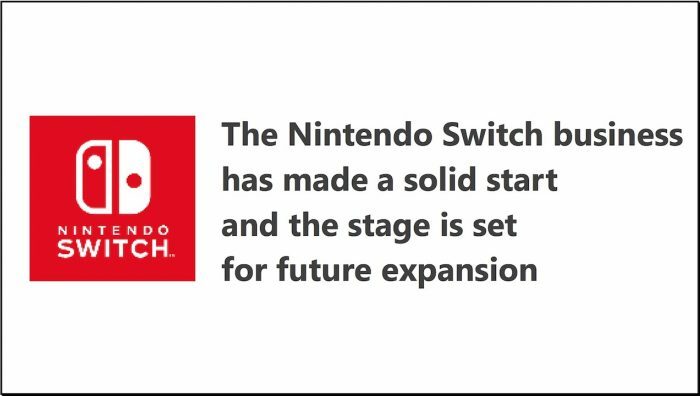 It is important that we deliver new titles in our key franchises to all game fans and Nintendo fans who purchased Nintendo Switch during the first year. 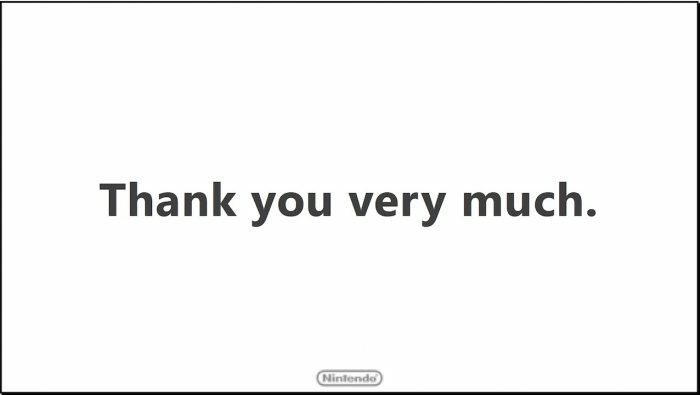 That is why we announced in a Nintendo Direct presentation in March that we would release Super Smash Bros. (temp.) in 2018. We heard people clamoring for this series to come to Nintendo Switch, so the title announcement in March made a big splash. 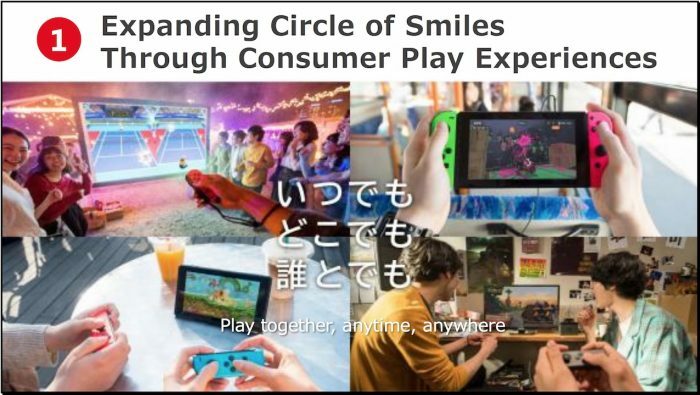 This title is perfectly suited for the Joy-Con sharing feature of Nintendo Switch and people can begin competitive gameplay at anytime anywhere. 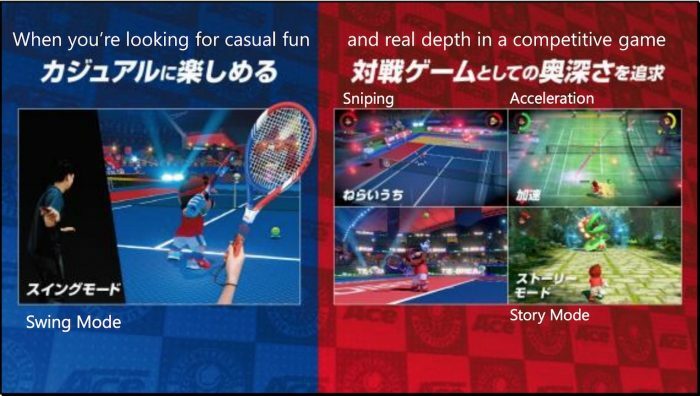 There is a “swing mode” where the Joy-Con controllers can be used intuitively like a tennis racket using motion controls. 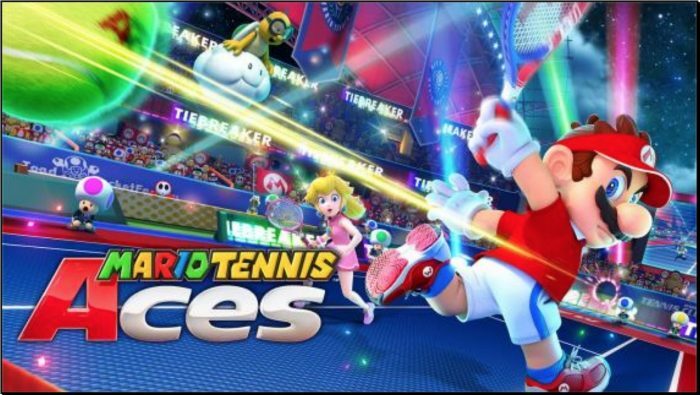 There is also a “story mode” for a different kind of single-player tennis fun. Plus there will be events designed to promote online battles as a way to keep up interest in the title. This is a broadly accessible title that anyone can pick up a play, but it also offers a tactical depth that can keep players challenged. This is one of the titles we expect will play a key role during this fiscal year. We are providing more downloadable content and hosting events that build excitement for our games to give consumers a fresh sense of enjoyment and extend the time they spend playing the titles they have purchased. The way Splatoon 2 is being played in Japan is an example of how efforts on the game software side can also impact the use of the hardware. The vertical axis of this graph depicts the number of active users over the passage of time across the horizontal axis. Normally, hardware use tends to drop off to a certain extent after the holiday season, but with Splatoon 2, the weekly number of active users remained high even beyond the start of the new year. 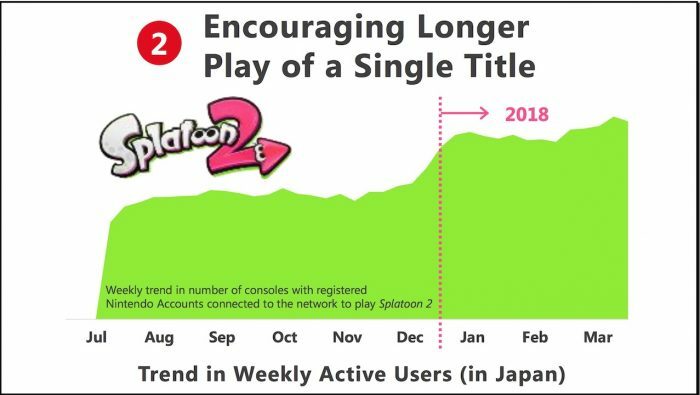 Activity in Splatoon 2 is particularly high in Japan, but that same trend is now also being seen in other markets, so we intend to continue to focus on this area. 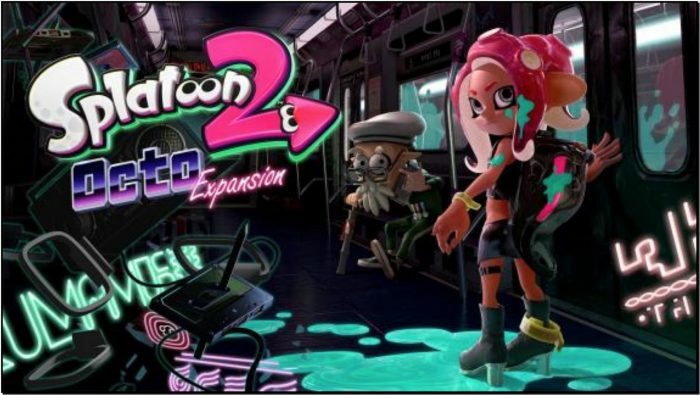 Octo Expansion for Splatoon 2 will be available this summer as a major paid add-on content release. It will give consumers who purchased this title even more ways to enjoy the game. 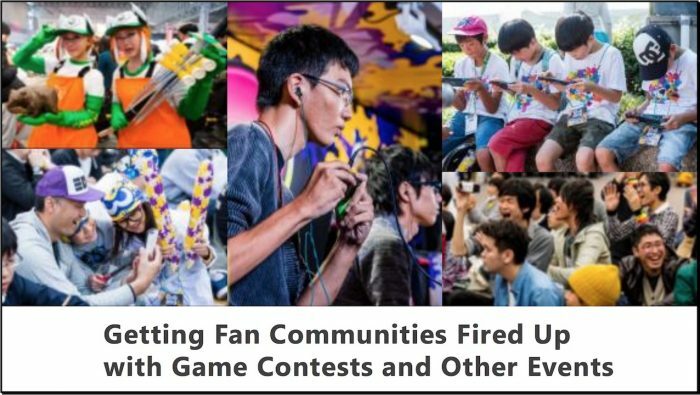 For titles like ARMS and Splatoon 2, we have had large turnouts worldwide at Nintendo-hosted game contests and events that bring game characters to life in the real world. For fans, game contests are more than just a place where they put their practiced skills to the test in gameplay. 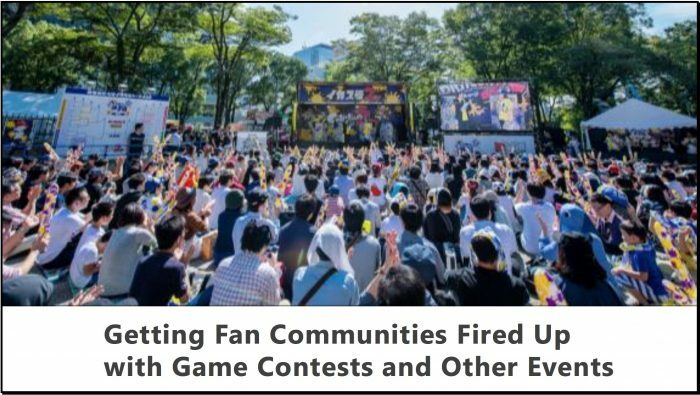 It is also a place where many people can come together through a single game to socialize and feel the energy of the community. And the gathering, in turn, fuels excitement in the game. We intend to continue to investigate fun projects, including these sorts of experiences that go beyond gameplay, to keep as many consumers as possible interested in our products and enjoying individual games far into the future. 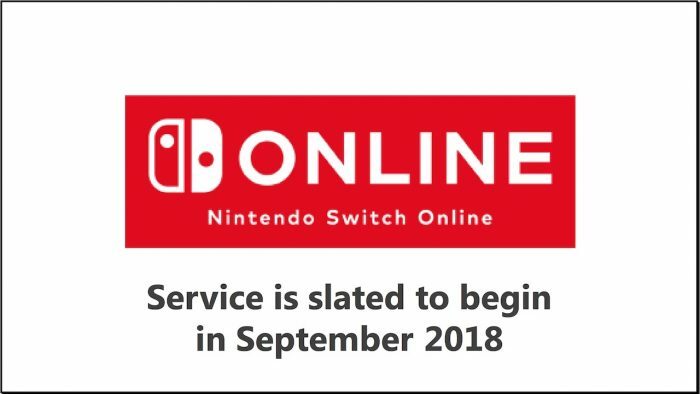 Nintendo Switch Online, a paid subscription service that will expand the online functionality of Nintendo Switch, will begin in September of this year. The service will provide consumers with a richness of online features that allow them to continuously enjoy Nintendo Switch. More information will be presented on our website in early May. Consumers who are members of My Nintendo receive Gold Points when purchasing Nintendo Switch games and add-on content. 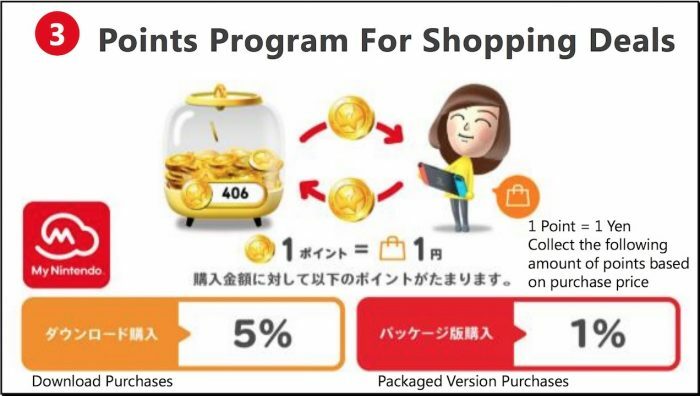 Starting in March, consumers can use each accumulated Gold Point as one yen when purchasing Nintendo Switch downloadable software, addon content, and subscriptions. 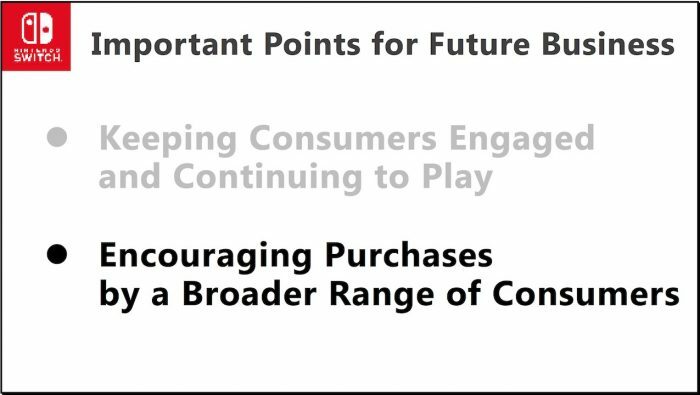 This points program encourages consumers to play new games while offering them the sense that they are saving on purchases. Note: Gold Points can be used for purchases on Nintendo eShop for Nintendo Switch and on the Nintendo website. The My Nintendo points program has been revamped worldwide, which means that in the US market, for example, each Gold Point is worth 1 cent when making purchases. To further expand the installed base of Nintendo Switch moving forward, another important point will be to see a wider range of consumers purchase Nintendo Switch. The response to the Nintendo Switch concept of being able to play anytime, anywhere, with anyone has been adopted by our consumers at speeds that exceeded our expectations. However, there are still consumers who do not yet know about the unique features of Nintendo Switch. The value and appeal of Nintendo Switch is becoming more broadly known as consumers take it out and play in a wide variety of scenarios. These types of experiences have the potential of broadening the Nintendo Switch installed base, even among consumers who did not think Nintendo Switch would be for them. 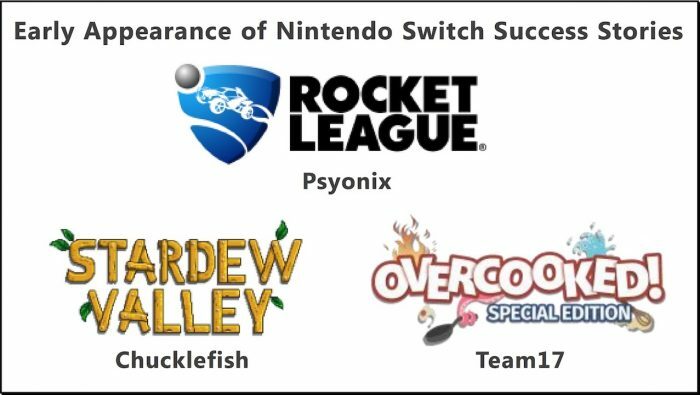 Fortunately, there are already plenty of key Nintendo titles available that maximize the appeal of Nintendo Switch. I have already mentioned how consumers who have purchased Nintendo Switch are able to enjoy these titles for a long time. The continued buzz among these consumers gives new consumers more chances to learn about these titles. 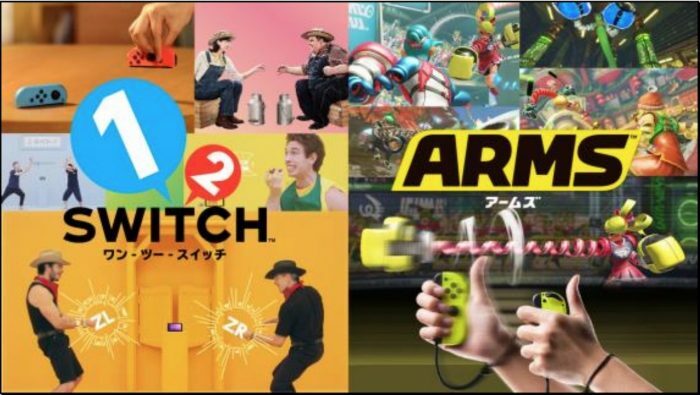 Games that are available now like 1-2-Switch and ARMS offer gameplay experiences that are unique to Nintendo Switch, and they allow larger groups to have fun together. We are learning from the sales growth of these titles to further our ability to expand our consumer base and to grow unit sales even more. 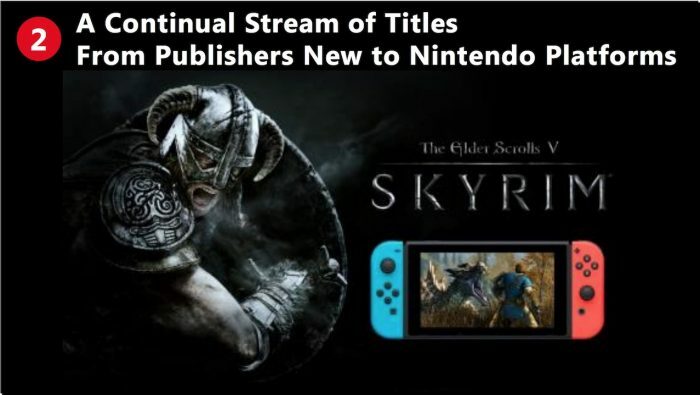 There are also titles being released by publishers who had previously not been seen on Nintendo platforms, such as The Elder Scrolls V: Skyrim from Bethesda Softworks. When these publishers release their titles for Nintendo Switch, their sales grow. Even for titles that were already available on other companies’ platforms, it seems that consumers are experiencing new ways to have fun when those titles are combined with the unique hardware features of Nintendo Switch. These publishers are preparing new ideas for consumers who purchased Nintendo Switch so they could enjoy these types of titles. A wide variety of publishers of all sizes from regions around the globe including indie developers have been on board since the release of Nintendo Switch, thanks to the early availability of a development environment. 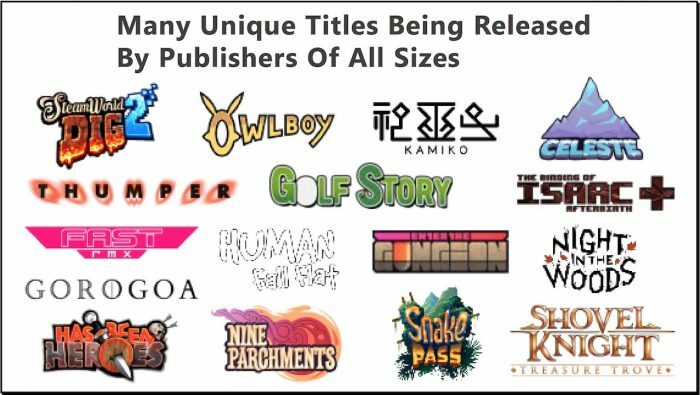 The number of titles available for purchase on Nintendo eShop from publishers stood at over 600 titles as of the end of March 2018. This pace of availability on Nintendo eShop is over 10 times the rate seen for the same period after the Nintendo 3DS launch. We see this as an expression of how the new approach of Nintendo Switch is resonating with publishers around the world. And we expect this trend to continue. 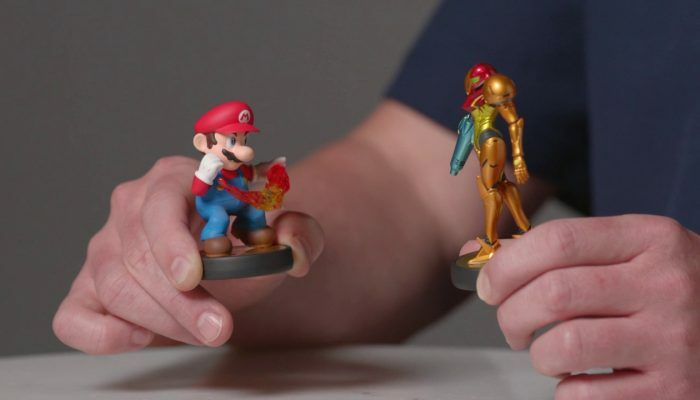 Indie developers have realized ideas that utilize the special features of the Nintendo Switch hardware, and their unique features of gameplay and operability have won praise from consumers and the media alike. 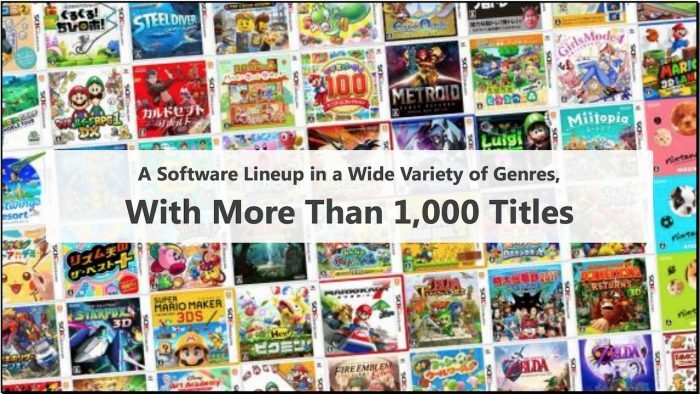 Note: The number of titles is the total number of titles available from Nintendo eShop sites around the world. Localized titles are not counted as separate titles. Several titles from these indie developers have remained at the top of the download rankings. One example is Rocket League, which was released last November. This title is now also available as a packaged version in markets outside of Japan and many people have enjoyed its game play around the world. Another example is Stardew Valley, which is heading for global sales of 1 million units after being released last October in the US and Europe, and then in Japan at the start of this year. And Overcooked: Special Edition, which was released last summer in Japan and other markets, has already sold over a half-million units. 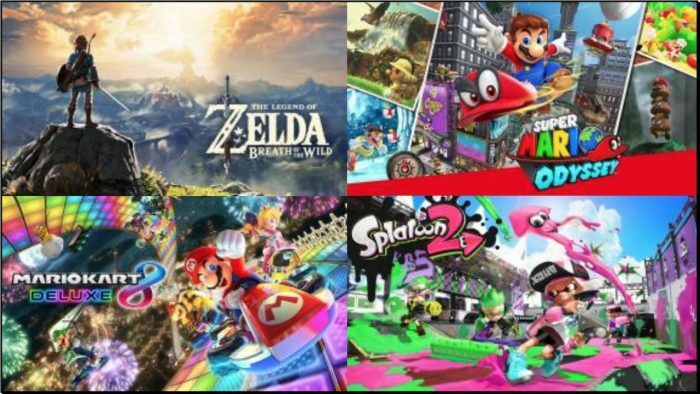 All of these titles were released for other companies’ platforms before ever being available for Nintendo Switch, so it seems consumers have recognized how well they fit with the “anytime, anywhere, with anyone” concept of Nintendo Switch. Titles from indie developers have a particular presence in the North American and European markets. Compared to other parts of the world, there is still work to be done in Japan to expand awareness of titles from indie developers. We want to give as many consumers as possible the chance to find the kinds of games they have always wanted to play. By expanding the game genres and increasing the number of game titles, we anticipate more interest from consumers who originally had little interest in Nintendo platforms. As software publishers release more titles in a wider range of genres, the Game News feature of Nintendo Switch provides one way for consumers to encounter the games they want to purchase next. Game-related announcements are delivered basically daily to Nintendo Switch while it is connected to the Internet, both from Nintendo and from third-party publishers. 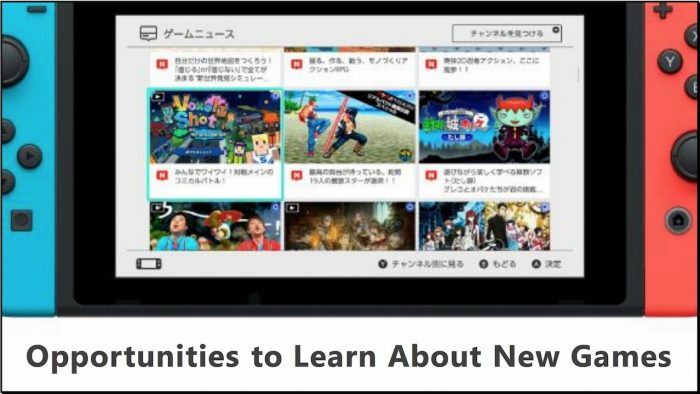 With Game News, consumers can read articles and jump immediately to Nintendo eShop to make a purchase if something looks interesting. We find that a considerable percentage of consumers who play Nintendo Switch also browse through Game News posts. With the version update we have made various improvements, including a way to follow channels. With this addition, consumers can choose to directly get information from publishers about the games they are playing and about games they are interested in. In addition, Nintendo is providing a new kind of play with Nintendo Labo, which people have been calling a “very Nintendo” kind of product. We intend to nurture Nintendo Labo into one of our staple products that provide an experience that is unique to Nintendo Switch, and reach a broad global audience encompassing not just traditional video game fans, but also people who heretofore had no interest in video games. Next, we will discuss Nintendo 3DS. 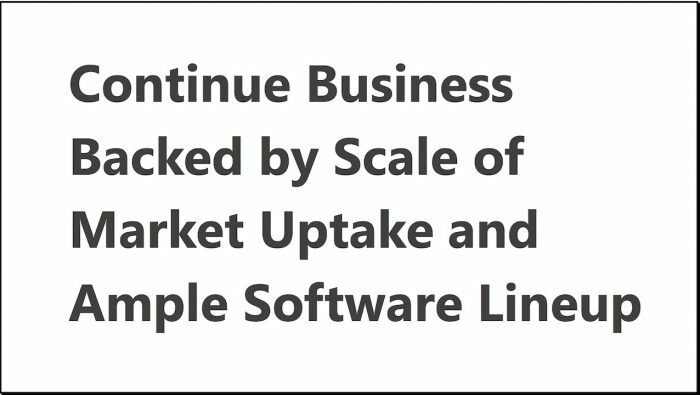 Note: This number includes both packaged and download-only software. 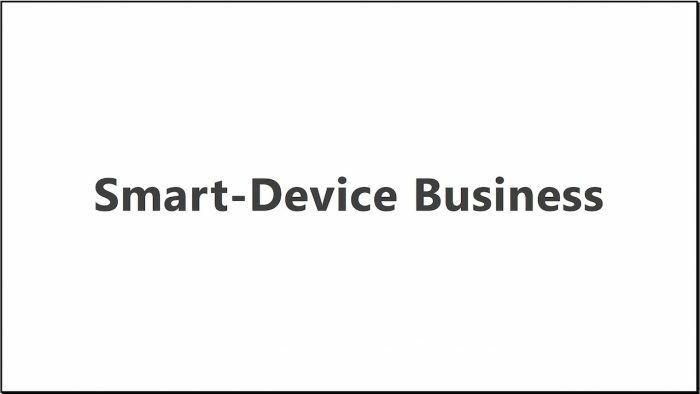 The next topic is our smart-device business. 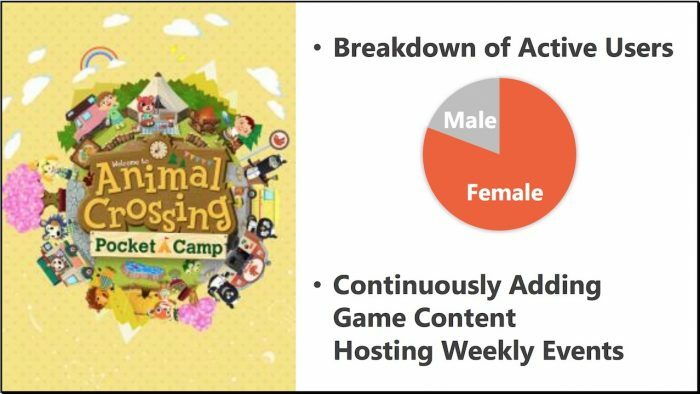 Animal Crossing: Pocket Camp was released in October of last year, and many people have played the game since then, especially adult women. Moving forward, we will make updates to add game content and continue to hold weekly events. Television commercials will air in Japan as well. We intend to continue to improve the service in ways that make the game more fun for consumers, all the while considering how this title contributes to revenue. 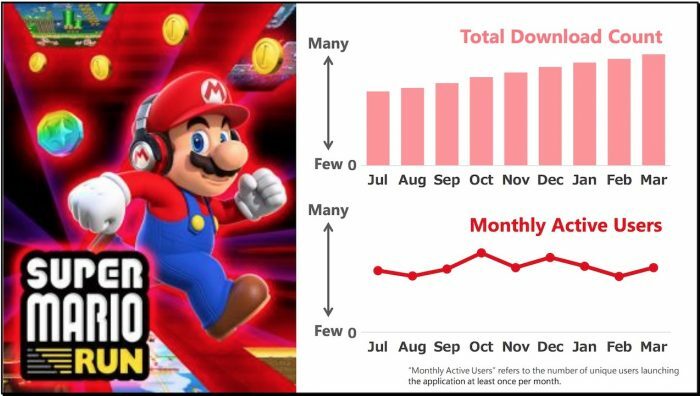 The number of Super Mario Run downloads continues to grow, despite the fact that it was released over a year ago now. This title is maintaining a base of approximately 20 million monthly active users. And as one of our evergreen titles for smart devices, we will continue to look to it as a way to maximize the number of people who have access to Nintendo IP across an expanding number of consumers worldwide. Fire Emblem Heroes became available in Hong Kong, Taiwan, Macao, Thailand, and Singapore as of November of last year, and this February marked the one-year anniversary of the application’s release. We have been able to keep our active users while expanding the user base, and sales have continued to grow without slowing. 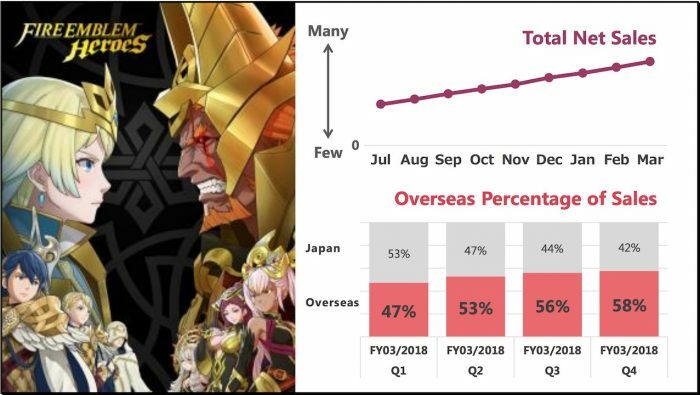 One might expect the Fire Emblem series to be most popular within Japan, but for Fire Emblem Heroes the share of overseas sales is steadily growing. Moving forward, we will work to continually expand on measures designed to excite consumers. 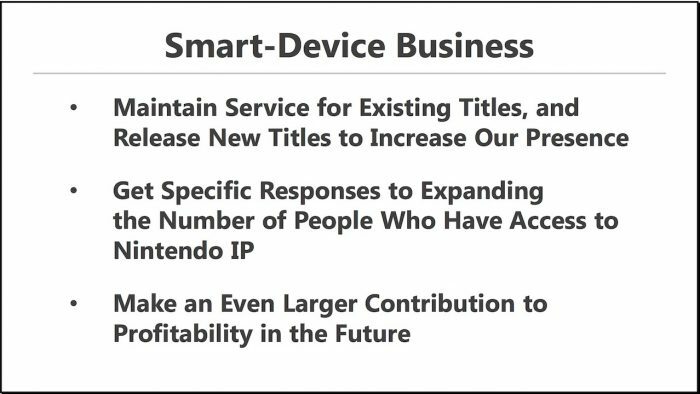 For the smart-device business, we will continue the services for existing applications while also releasing new applications in order to increase Nintendo’s presence in this business. The efforts we have made to date have yielded certain responses to our goal of expanding the number of people who have access to Nintendo IP. Even so, we have not reached a satisfactory profit point yet, so our goal is to further expand the scale of this business to develop it into one of the pillars of revenue. Today, we announced the partnership with Cygames for a new gaming application for smart devices, aiming to bring to life the shared vision of a new gaming experience with worldwide appeal. 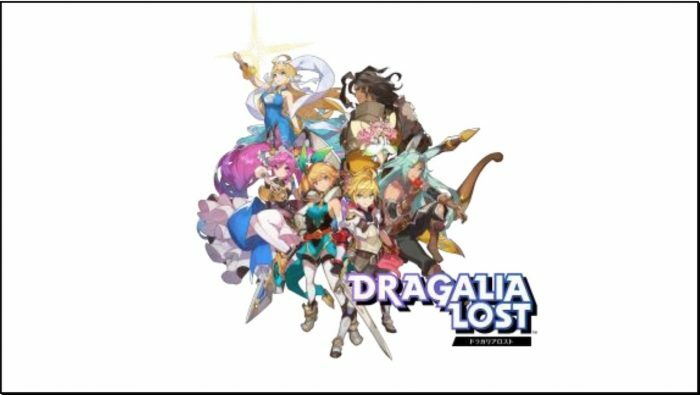 As a result of this partnership, Nintendo will release Dragalia Lost, an all-new original gaming application, in the summer of 2018, starting with Japan, Taiwan, Hong Kong and Macau. 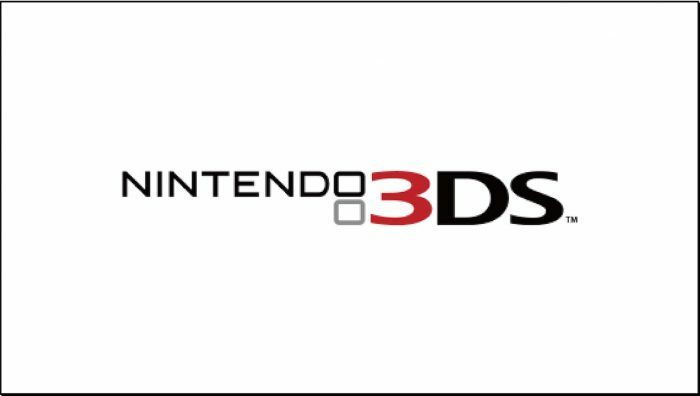 With the support of Nintendo’s group companies, it will launch in North America and Europe as well. The game was designed by Cygames and co-developed with Nintendo. Both companies will jointly operate the game. More information about the game content will be announced on the website today (*not in English). 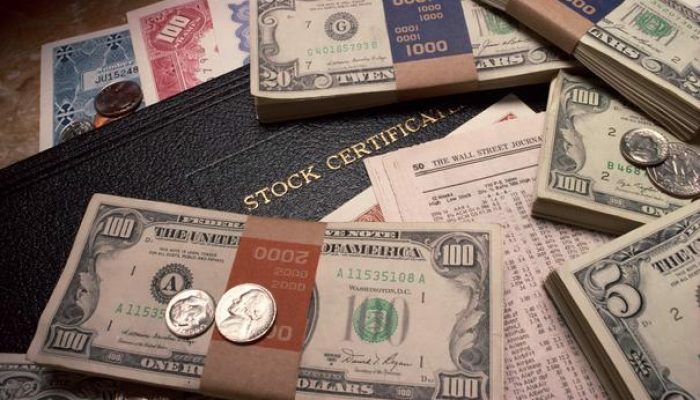 For the purpose of facilitating the partnership, Nintendo will obtain approximately 5 percent of Cygames’s issued stocks mainly through a third party allocation of its treasury stock. 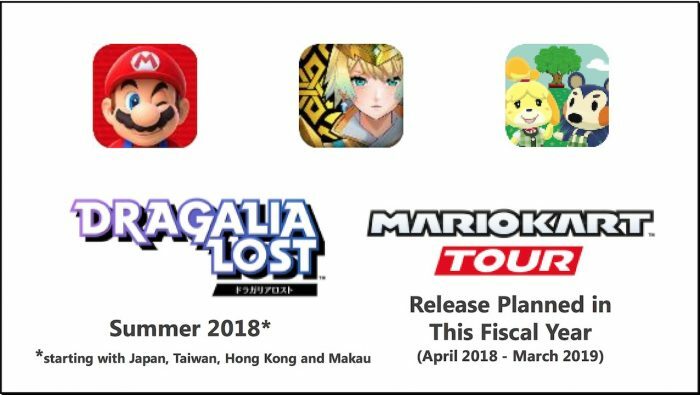 In addition to the titles already described for the smartdevice business, we also plan to release Mario Kart Tour as a Mario Kart application for smart devices during this fiscal year (April 2018 – March 2019). We will work to continuously expand our business through these titles. 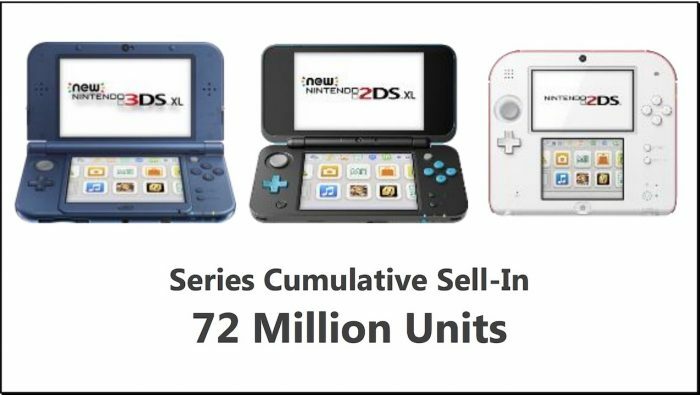 During the fiscal year ending March 2019, we plan to drive results by positioning Nintendo Switch, which is expanding its installed base, at the core of our business, as well as through the continuation of the Nintendo 3DS business, and by expanding the scale of our smart-device business. 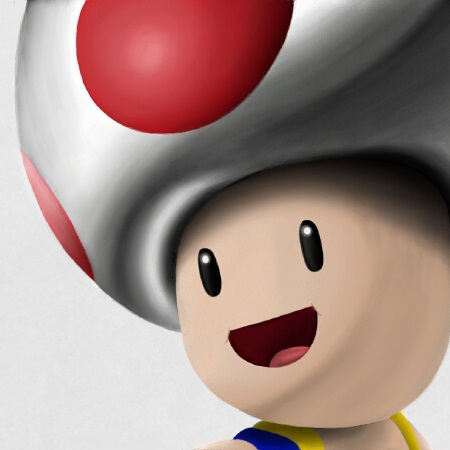 We will also move forward with our goal of expanding the number of people who have access to Nintendo IP. And finally, the video game tradeshow E3 will be held in Los Angeles this June. 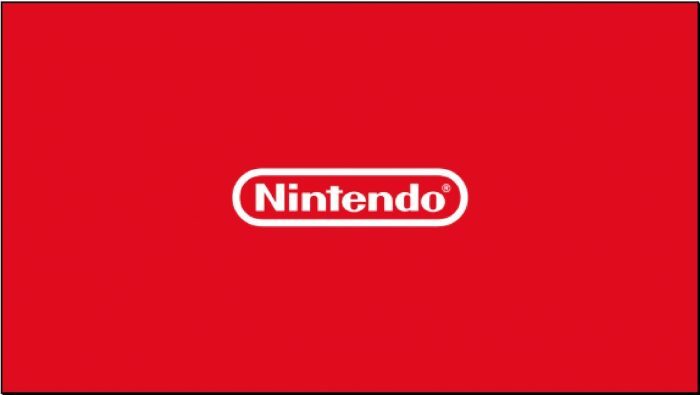 Again this year, Nintendo will not be hosting a large-scale press conference for institutional investors, analysts and the media. Instead, we plan to continue our practice from the past few years of utilizing a video presentation to introduce the games that are planned for release during the year. 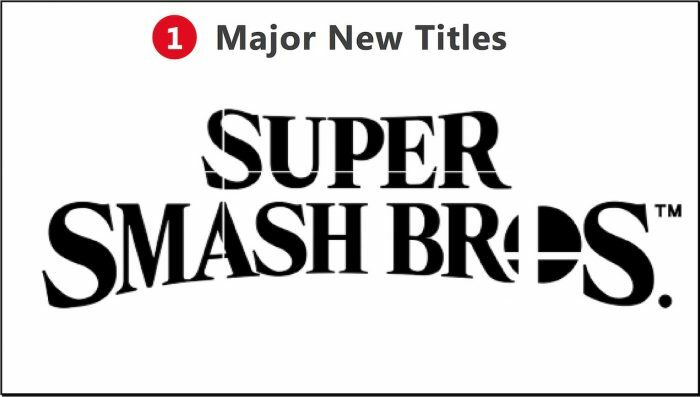 The Nintendo booth at E3 will offer attendees a chance to try some of our own titles, including the Super Smash Bros. title for Nintendo Switch that we announced the other day, plus Nintendo Switch titles from other publishers. At another venue in Los Angeles, we will host the Splatoon 2 World Championship, in which teams that won their regional qualifiers will compete. We will also host an invitational tournament for the new Super Smash Bros. title coming to Nintendo Switch.